This easy Cheesy Hot Crab Dip recipe makes a delicious appetizer for holiday parties, gameday, or any occasion that calls for amazing snacks! Simple to prepare and bakes in 30 minutes! 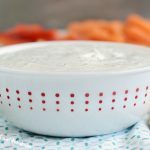 This easy recipe for baked crab dip is so simple to make and a little bit different than the usual crab dip recipes because this is made without mayonnaise or sour cream. It’s just cream cheese, crab and more cheese — plus a few other ingredients. 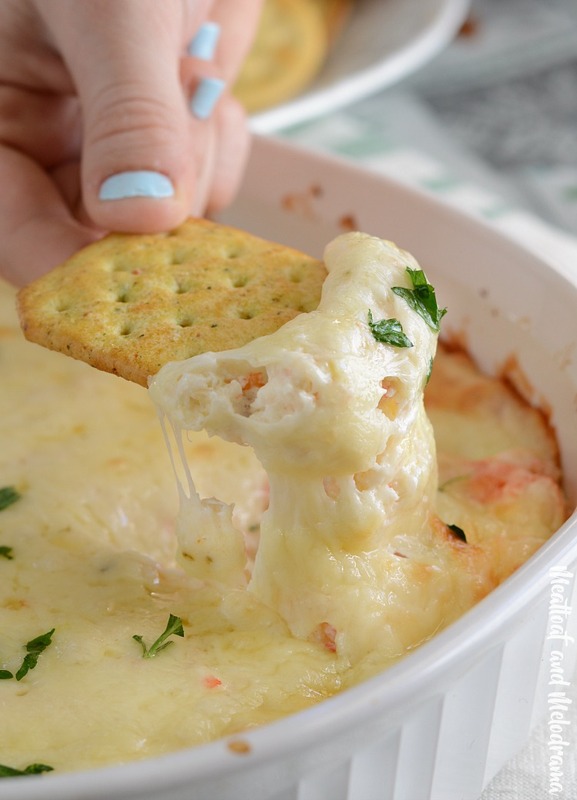 If you’re looking for a delicious party dip, you need to try this cheesy hot crab dip! So, ’tis the season for appetizers, right? Now, if you’re like me, you can munch on chips and dips anytime, but holiday entertaining calls for appetizers and snacks that are extra special. 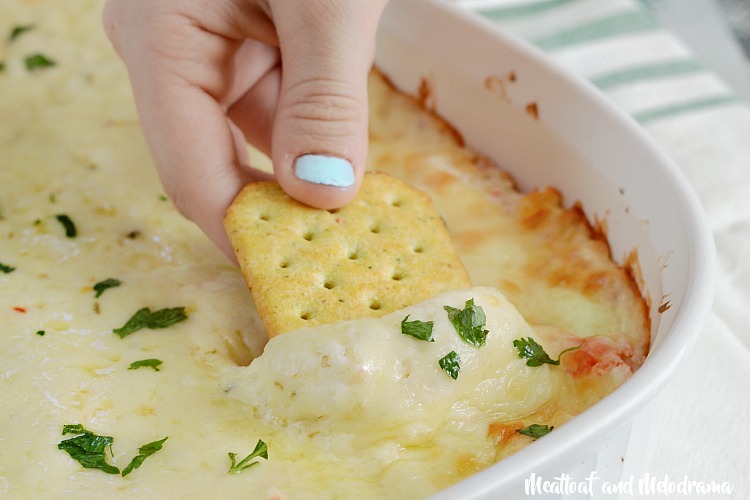 And hot cheesy dips are ideal for fall and winter! This is another recipe from my grandma’s collection. I actually found this one last summer, but the idea of a hot dip isn’t all that appealing when it’s even hotter outside! I ended up making cold avocado crab dip, instead, and I put this recipe on the back burner — until now. 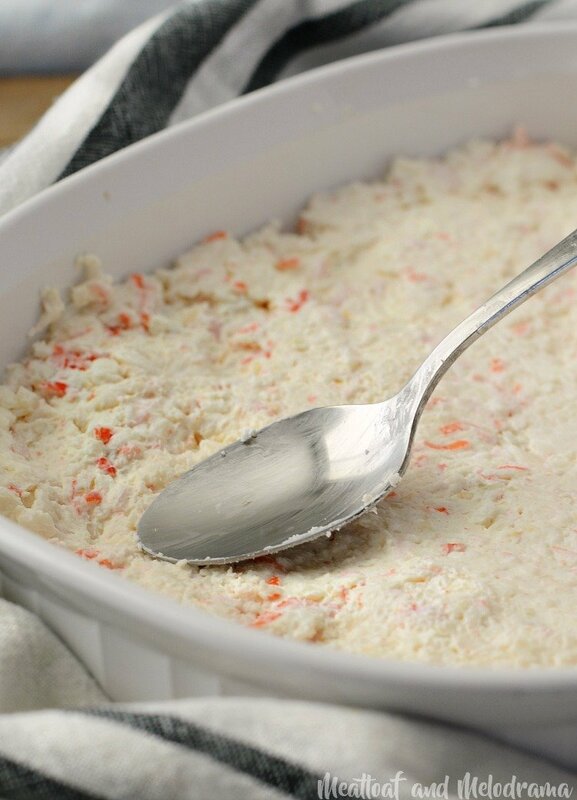 Like I said, this crab dip is super simple to make, and you only need a few ingredients. 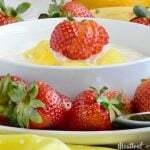 It doesn’t use mayo or sour cream, so it’s a little bit thicker than some recipes. But, you guys, this dip is absolutely, positively delicious! All you do is mix the cream cheese with the crab and other ingredients. To make it easier, I used a hand mixer for this part, which also helped to break the crab up into smaller pieces. You could definitely use a spoon, but the mixer just made it easier to blend. When it’s all blended, just spoon the dip into a shallow baking dish, and spread it out so it’s nice and even. The original recipe didn’t call for any extra cheese, but I couldn’t resist. I mean, cheese and hot dips are made for each other, right?! I used a mix of pepper jack and Monterey jack, but just about any shredded cheese would work. Just bake the dip for about 30 minutes, and dig right in! 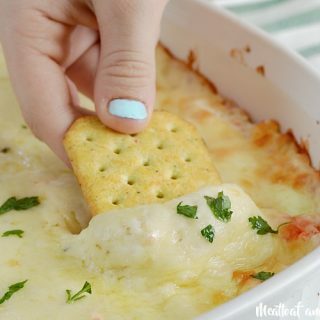 This crab dip is super thick and cheesy, so be sure to serve it with crusty bread or crackers that can handle all of the ooey-gooey goodness. But watch out — This dip is crazy good and definitely addicting. Once you start munching, it’s hard to stop! 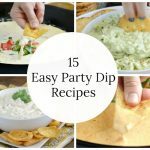 Looking for more hot cheesy party dip recipes? This cheesy hot crab dip is loaded with crabmeat and cream cheese and topped with more cheese for a delicious appetizer your guests will love! I hope you enjoy this easy cheesy hot crab dip as much as we do! This recipe is shared at the Weekend Potluck. In a family of seafood lovers, this would be the BEST appetizer! My kids aren’t huge seafood fans, but even they loved this dip! Oooooh hot crab dip is one of my favorites!! Wow, so luxurious. For sure one of the best dips I have seen to date. I love crab dip and this looks fantastic! 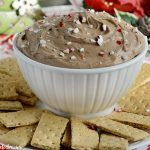 Perfect holiday appetizer! Now, THIS is my kind of dip! Love the addition of the horseradish!! I think this will be the perfect appetizer for my Christmas Eve party this year. 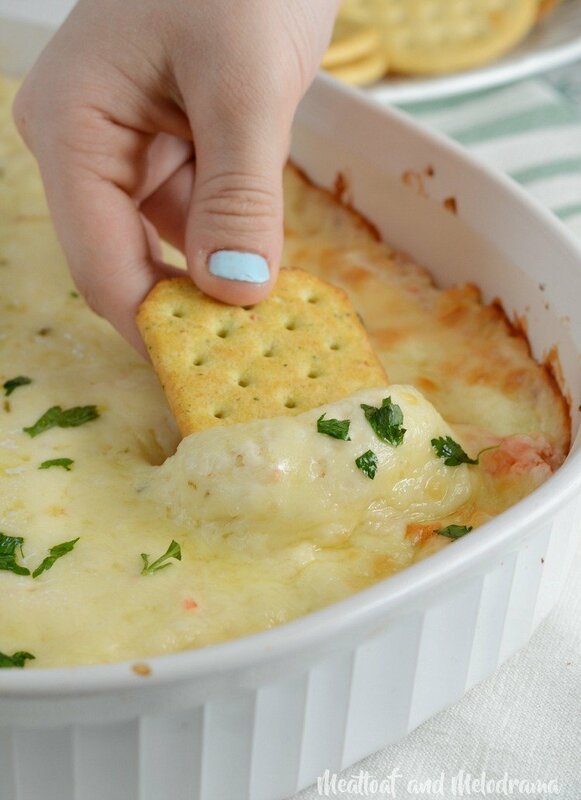 Your Cheesy Hot Crab Dip will be great for the holiday parties! Hope you have a great week and thanks so much for sharing with us at Full Plate Thursday.